Jazz is timeless and universal… Thus, it is played and heard in all corners of the world, and the Silver Coast (Cote d’Argent) of France is no exception: in fact, it provides the perfect setting for elegant and convivial jazz! 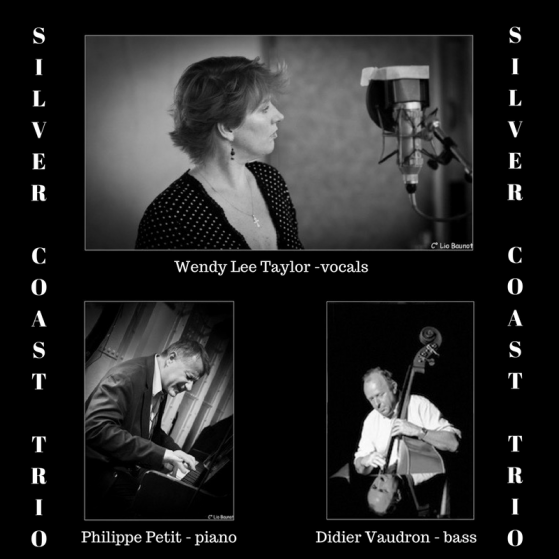 The Silver Coast Trio is all of that and more, as it’s based on a friendship and complicity of over 30 years between pianist Philippe Petit and double bassist Didier Vaudron, a collusion that could not avoid seducing the Australian singer and tap dancer Wendy Lee Taylor, soloist at the Lido de Paris for 15 years. The trio can adapt easily to differing situations from the cosy atmosphere of a hotel bar or a restaurant, to a concert hall. For major events or when the nature of the event requires, the trio can easily include a drummer, at which point it becomes The Silver Coast Quartet! Born in Melbourne (Australia), Wendy Lee Taylor was enchanted by musical theatre. From five years old, she started dancing classes, and quickly started learning songs from the standards repertoire including titles by Cole Porter, George Gershwin or Irving Berlin, to site just a few… It was as a dancer, then as a singer that this tall Australian debuted her Parisian career at the famous Parisian Cabaret “Le Lido” where performed initially as a dancer, then later as a singer , 6 nights a week, for fifteen years. With Wendy, charm and swing unite, in keeping with the tradition of the great jazz vocalists. Over the years he has accompanied artists numerous soloists including Arnett Cobb, Bud Shank, Scott Hamilton, Houston Person, Eric Alexander, Dany Doriz, Marc Fosset, and of course the Silver Coast Trio! This list only includes concerts for the project “Silver Coast Trio”. For a complete list of upcoming events for all Wendy’s projects, please consult the main events page of this website.